Fire up the grill and inflate your swim floats! It’s time to celebrate the 4th of July! Independence Day is typically a day full of fun, sun, food, and capped off with a terrific firework display. While this holiday can be lots of fun for the humans, many animals can become very anxious and stressed. We’ve got a few tips for you to make this as great of a holiday as possible. 1. Let’s begin with the food portion of the day, shall we? A few table scraps here and there won’t hurt your dog, but there are certain foods you should never give them. Avoid corn cobs, cooked bones of any kind, onions, grapes, and anything too fatty. These can all cause upset stomach, vomiting, diarrhea, or even a blockage in the pet’s intestines. A couple of small pieces of fully cooked, unseasoned white meat chicken are a great treat! 2. While the fireworks are a beautiful sight, the loud noises can be very stressful for your pets. How can you help ease the stress? Before the fireworks begin, take your dog out for a walk or to the park to play ball. This can help get some of their energy out and help them be more relaxed. A little while before the fireworks start, find a room where you and your pet can hang out. A room with some sort of ambient noise is best. This could be the A/C, a TV, radio, fan, or even a sound machine. If you know your dog has noise related anxiety, you can try a Thundershirt or a similar product. The Thundershirt wraps snugly around the dog, which makes it feel more secure. 3. If you feel your pet has extreme anxiety, give us a call today to schedule an appointment. There are medications that can help, if this is what Dr. Katie and you decide is best for your pet. Is your pet already on anxiety medication? Please make sure you have enough medication to get your pet through! We will close at 2:00pm Saturday, July 2, 2016, and will re-open at 8:00am Tuesday, July 5, 2016. 4. 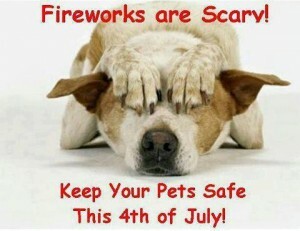 Do not leave your pets outside during parades or firework displays! Even if your dog is not typically afraid of strange or loud noises, it is better to bring them inside and not run the risk of them escaping your yard. Of course, you can take them out to go potty, but be sure they are wearing their collar with easy to read ID tags. 5. Did you know that more dogs go missing on the 4th of July than any other day of the year? It’s true! Animal shelters and animal control are very busy July 5th bringing lost dogs to the shelter. In order to reunite these dogs back with their owners, it is important to make sure your dog’s microchip information is up to date. If your pet is not microchipped, call us today and we can schedule an appointment for your pet to be microchipped. It only takes a few minutes and does not require anesthesia! 6. Do NOT bring your pet to a fireworks display!! The noises, scents, sights, and all the people can be extremely overwhelming and down right terrifying for your pets. Your pet will be much safer at home. 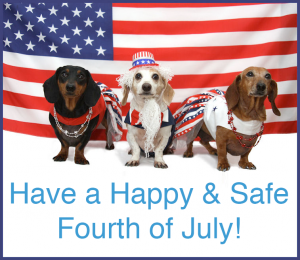 Keep this tips in mind and you and your pet can enjoy a wonderful day full of celebration! Happy Independence Day everyone!